Heiker Meneses does not have any MLB stats for the season. Heiker Albert Meneses (pronounced A-kerr man-ESS-iss)…Signed by:Craig Shipley and Fernando Veracierto. Shuttled between Portland (AA) and Pawtucket (AAA) all season...At Pawtucket, hit in every position in the lineup except cleanup...Batted .386 with an .890 OPS vs LHP...Was on the DL, 6/12-19 (left foot contusion)...Following the season, played for La Guaira in the Venezuelan Winter League. Began the season with Rochester (AAA)...Appeared in 18 games before being placed on the DL on 5/13 (fractured left wrist)...Beginning on 7/19, played 12 rehab games for Gulf Coast League Twins (R) before being activated and transferred to Chattanooga (AA) on 8/9... Transferred back to Rochester on 8/15 for the remainder of the season...Played for La Guaira in the Venezuelan Winter League. Spent the season with Chattanooga...Appeared in games at 1st base, 2nd base, 3rd base and SS...Played for La Guaira in the Venezuelan Winter League. Opened the season with Pawtucket before being transferred to Portland on 4/25 for the remainder of the season...Played in a career-high 111 games between the two levels...Appeared defensively at 2nd base, 3rd base and SS...Played for La Guaira in the Venezuelan Winter League. Combined for a .253 AVG (95-for-376) in a career-high 110 games between both levels...Hit .312 (34-for-109) against left-handed pitching between the 2 stops...Split time between SS (55 games) and 2B (54 G)...Led the Sea Dogs with 48 games at SS...Had his best single-month AVG in April (.295)...Homered in Portland's season-opener on 4/4 vs. Trenton...Hit an inside-the-park home run on 4/16 at Binghamton…It was the 6th inside-the-parker in franchise history, 1st since George Lombard on 6/24/04 at Erie...Promoted to PawSox on 8/13…Club won 14 of his 18 starts over the club's 21 remaining regular season games...Played in all 9 of Pawtucket's playoff games, batting .222 (6-for-27)...After the season, hit .313 (10-for-32) in 15 contests for Tiburones De La Guaira of the Venezuelan Winter League. Appeared in 44 games at 2B, 40 at SS, and 22 at 3B...Combined to hit .345 (30-for-87) against southpaws...Began the season with the Sea Dogs before missing time on the DL from 4/29-5/9 with a left shoulder strain...Transferred to Salem on 6/10 and placed 2nd on the club with 4 triples and 3rd with 18 steals...Hit safely in 10 straight games from 7/23-8/4 at .318 (14-for-44) with 5 extra-base hits and 10 RBI in that stretch...After the season, played in 1 game for La Guaira of the Venezuelan Winter League. Posted his highest career single-season AVG...Tied for the Red Sox minor league lead in triples (7) and had the 4th-highest AVG in the system...Began the season with the Drive and was transferred to Portland on 7/5...Played in 24 games with Portland and was sent to Salem on 8/9, where he ranked 2nd on the club with 5 triples in 26 games...Hit safely in 1st 12 games with Salem at a .438 clip (21-for-48) from 8/9-21 with 5 doubles and 3 triples...After the season, played 2 games for Tiburones de La Guaira of the Venezuelan Winter League. Led GCL 3B in fielding pct. (.949)...Also topped the GCL Red Sox in steals (17) and was 2nd in hits (52) and total bases (75)...Hit safely in 17 of 19 games from 7/1-22, including a pair of 8-game hit streaks. Led league shortstops with 130 putouts. Made his pro debut with the DSL Red Sox. November 2, 2018 2B Heiker Meneses elected free agency. October 23, 2018 2B Heiker Meneses assigned to Tiburones de La Guaira. 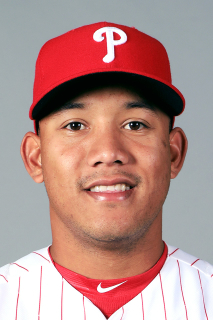 June 29, 2018 2B Heiker Meneses assigned to Reading Fightin Phils from Lehigh Valley IronPigs. June 20, 2018 2B Heiker Meneses assigned to Lehigh Valley IronPigs from Reading Fightin Phils. June 1, 2018 2B Heiker Meneses assigned to Reading Fightin Phils from Lehigh Valley IronPigs. April 30, 2018 2B Heiker Meneses assigned to Lehigh Valley IronPigs from Reading Fightin Phils. April 23, 2018 3B Heiker Meneses assigned to Reading Fightin Phils from Lehigh Valley IronPigs. April 20, 2018 3B Heiker Meneses assigned to Lehigh Valley IronPigs from Reading Fightin Phils. April 9, 2018 3B Heiker Meneses assigned to Reading Fightin Phils from Lehigh Valley IronPigs. April 5, 2018 3B Heiker Meneses assigned to Lehigh Valley IronPigs from Reading Fightin Phils. April 2, 2018 3B Heiker Meneses assigned to Reading Fightin Phils from Lehigh Valley IronPigs. January 8, 2018 2B Heiker Meneses assigned to Gigantes del Cibao. January 8, 2018 Heiker Meneses assigned to Gigantes del Cibao. January 3, 2018 Philadelphia Phillies signed free agent 3B Heiker Meneses to a minor league contract and invited him to spring training. January 3, 2018 3B Heiker Meneses assigned to Lehigh Valley IronPigs. November 6, 2017 2B Heiker Meneses elected free agency. October 9, 2017 3B Heiker Meneses assigned to Tiburones de La Guaira. June 20, 2017 Pawtucket Red Sox activated 2B Heiker Meneses from the 7-day disabled list. June 13, 2017 Pawtucket Red Sox placed 3B Heiker Meneses on the 7-day disabled list retroactive to June 12, 2017. Left foot contusion. May 24, 2017 3B Heiker Meneses assigned to Pawtucket Red Sox from Portland Sea Dogs. May 13, 2017 3B Heiker Meneses assigned to Portland Sea Dogs from Pawtucket Red Sox. May 2, 2017 3B Heiker Meneses assigned to Pawtucket Red Sox from Portland Sea Dogs. April 4, 2017 3B Heiker Meneses assigned to Portland Sea Dogs from Pawtucket Red Sox. February 26, 2017 3B Heiker Meneses assigned to Boston Red Sox. January 20, 2017 3B Heiker Meneses assigned to Pawtucket Red Sox. December 25, 2016 Boston Red Sox signed free agent 3B Heiker Meneses to a minor league contract. November 7, 2016 3B Heiker Meneses elected free agency. October 5, 2016 3B Heiker Meneses assigned to Tiburones de La Guaira. August 15, 2016 3B Heiker Meneses assigned to Rochester Red Wings from Chattanooga Lookouts. August 9, 2016 3B Heiker Meneses assigned to Chattanooga Lookouts from Rochester Red Wings. July 19, 2016 Rochester Red Wings sent 3B Heiker Meneses on a rehab assignment to GCL Twins. May 13, 2016 Rochester Red Wings placed 3B Heiker Meneses on the 7-day disabled list. Fractured left wrist. April 6, 2016 3B Heiker Meneses assigned to Rochester Red Wings. December 17, 2015 Minnesota Twins signed free agent 3B Heiker Meneses to a minor league contract and invited him to spring training. November 6, 2015 3B Heiker Meneses elected free agency. September 20, 2015 3B Heiker Meneses assigned to Tiburones de La Guaira. April 8, 2015 3B Heiker Meneses assigned to Chattanooga Lookouts from Rochester Red Wings. November 20, 2014 Minnesota Twins signed free agent 3B Heiker Meneses to a minor league contract and invited him to spring training. November 20, 2014 3B Heiker Meneses assigned to Rochester Red Wings. October 9, 2014 3B Heiker Meneses assigned to Tiburones de La Guaira. April 25, 2014 3B Heiker Meneses assigned to Portland Sea Dogs from Pawtucket Red Sox. February 10, 2014 Boston Red Sox invited non-roster 2B Heiker Meneses to spring training. October 11, 2013 LF Heiker Meneses assigned to Tiburones de La Guaira. August 13, 2013 2B Heiker Meneses assigned to Pawtucket Red Sox from Portland Sea Dogs. April 3, 2013 Heiker Meneses assigned to Portland Sea Dogs from Salem Red Sox. February 21, 2013 SS Heiker Meneses assigned to Boston Red Sox. June 10, 2012 Heiker Meneses assigned to Salem Red Sox from Portland Sea Dogs. May 9, 2012 Heiker Meneses roster status changed by Portland Sea Dogs. April 29, 2012 Portland Sea Dogs placed 3B Heiker Meneses on the 7-day disabled list. April 4, 2012 3B Heiker Meneses assigned to Portland Sea Dogs from Salem Red Sox. March 16, 2012 3B Heiker Meneses assigned to Boston Red Sox. August 9, 2011 Heiker Meneses assigned to Salem Red Sox from Portland Sea Dogs. July 5, 2011 Heiker Meneses assigned to Portland Sea Dogs from Greenville Drive. April 27, 2011 Heiker Meneses assigned to Greenville Drive from GCL Red Sox. June 21, 2010 Heiker Meneses assigned to GCL Red Sox. December 31, 2009 DSL Red Sox released Heiker Meneses. October 23, 2007 Boston Red Sox signed free agent SS Heiker Meneses to a minor league contract.